Getting Started. The number of interesting and attractive patterns is almost limitless, so it is pretty to easy to find new patterns that you've never seen before. The best way to get started is to use some of the default saved patterns and make small changes to the parameters to see what happens. You should clear the figure after each change so you can see what the new pattern looks like. Attractive Patterns. The most attractive patterns are produced when the program draws complex patterns that repeat with a slight variation after each cycle and slowly evolve into different shapes. Producing these kinds patterns requires different strategies depending on which mode your are in. Two Wheel Mode. In Two Wheel mode, the slight variation is accomplished by having difference in the Wheel Size or Wheel RPM. The difference in these values changes the phase relationship between the two wheels with every cycle, which varies the pattern with every cycle. Planetary Modes. In the two Planetary modes, the wheels don't need to be different sizes or turning at different speeds to cause a variation. The variation is accomplished by the relationship between the small wheels and large wheels. For example, if the small wheels have diameter of 50, while the big wheels have a diameter of 100, the small circles will rotate rotate twice degree when the big circles rotates once. However, because the small wheel is rotating along with the big wheel, the relationship between the small wheel and the big wheel is constantly changing and the pattern produces three loops. If the sizes of the wheels are not an even multiples of each other, the relationship become much more complicated. For example, the image to right shows what happens if the size of the small wheel is by just to 52. 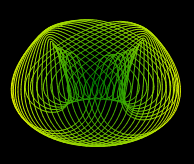 Instead of a loop with three lobes, that pattern has 38 lobes. Circle Size: Set both circles to the same size, preferably by using the Lock button. Wheel RPM: Set both wheels to the same speed, preferably by using the Lock button. Wheel Angles: Set both wheels to an angle of zero. Using these settings will produce circular, symmetrical patterns. As pointed about above, the number of lobes is controlled by size of the circle. Here are some circles sizes and the number of lobes they produce. More Complex Patterns. The spirograph patterns are enormously sensitive to the starting angles of the wheels. The image to the right was created by changing the starting angles of main and planetary wheels to 28 and 68 degree respectively. Lots of complex and beautiful patterns can be derived by starting with a spirograph and modifying the starting angles of the wheels. Some patterns take many cycles to develop, so don't give up on a pattern too soon.